At the outset of World War 1 the only aircraft designed for fighting in the air was the Vickers Gunbus (later FB5). Initial orders for the aircraft had come from the Navy but much of the production was handed over (transferred) to the Army for the RFC. 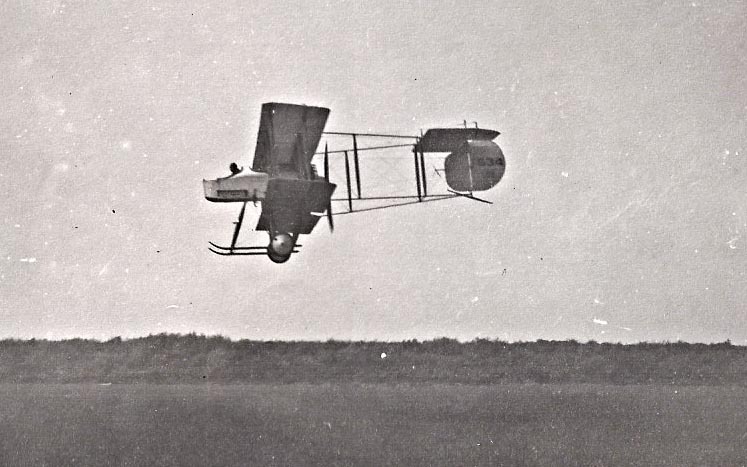 In the search for improved performance an engine designed by American aviation pioneer and engine designer Mr John W Smith, the Smith Static Motor, was trialled for the Vickers aircraft. Mr Smith moved to England in 1915 and set up the British Static Motor Company in Birmingham in partnership with Mr Charles Schofield. He brought with him from Chicago an experienced engine mechanic Mr Ralph Watson. During 1915 the engine was demonstrated to the Admiralty and the War Office and was installed that summer on two Vickers FB5 aircraft (serial no.s 1534 & 1535) for the Admiralty, the first of which was delivered to RNAS Eastchurch (Isle of Sheppey) on 7 August 1915. The Smith engine was relatively light and claimed to deliver 140 hp. "Just arrived in Birmingham from London, it takes a little over 2 hours to make the trip. I will be here for about a week I think unless they have trouble with the motor down at the flying field. I was out to the field [Joyce Green, Vickers test flight] yesterday and saw them off for the other flying field belonging to the Navy [RNAS Eastchurch]. And they want to play with it themselves for a few days and make a few more tests. I was up the other day Friday it was [30 July] with Mr. Barnwell the pilot [Vickers Chief test pilot Harold Barnwell], he is one of the very best there is over here so I am told and he knows how to fly all right. We were only up at 1200 to 1500 feet, took a trip over a little Suburb of London out there, and up and down over the Thames river and I felt much safer in it than in an auto doing 60 mile per. hr. and we were going better than 80 M.P.H." "I sent along a valve unit, which consists of valve cage, exhaust and intake valve so you could take out one of the old valves and put in the new one. The old valves that are in the motor come from the States, and I thought it would be well to keep one of these valves to show to anyone when I wished to convince that after the motor had made 200 hours run the valve was practically as good as new. The new Carburettor works perfectly on both high and low. The new sight feed [clear pipe for viewing the flow] works nicely for any amount of oil that I want to use it on, and you had better put in this new sight feed, and let it run a good bifuel stream to the extent of 1 1/4 gal. to 1 1/2 gal. per hour which means a pretty thick stream as the oil is heavy and moves slow. I gave the motor an hours run to-day to limber it up, and ground the valves. If it has the punch to-morrow I will call up the Officials for a test." 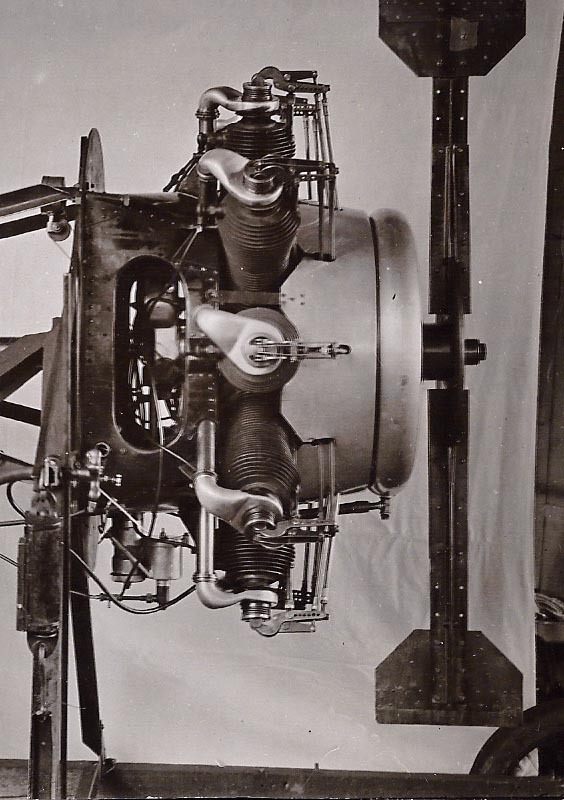 The Smith Radial engine was tested on Tuesday [18 Jan 1916]. It ran for an hour giving 140 hp. and then broke a valve rocker. Its weight is only 180 lbs. and if it can be got right it would seem that it would be a very useful engine. The same report notes however the imminent arrival of a squadron of FE2bs with 240 hp Rolls-Royce engines, another pusher aircraft that effectively took over from the Vickers FB5 and 9, and saw out the war as a night bomber. If you are getting into this game you will find that it must be a motor of the radial type and no doubt air cooled as that eliminates more weight than anything else and pounds per HP will always be the determining factor in aeroplane work. Besides the radial type lends itself to plane construction on mounting. It takes one man about 4 days to dismount a Sunbeam motor from a fuselage. I have taken one of Smiths motors (off) in 20 minutes. Working out your figures after the test today I find the engine gave 131.3 BHP at 1,275 and the petrol consumption was .67 pts per BHP hour. This seems to be very good and the engine certainly ran better than ever. It will be as well I think to lock the carburettor in the position we ran it in today as I should like it to go into the air just as it was. But as to the design and make of the engine there is nothing I can suggest as an improvement. As you know I have flown with the engine about a thousand miles and I certainly feel safer with it than almost any other engine I have been up with. What I like about it is the ease of control and absence of vibration over a wide range of speed and considering we have had to come down once only and that not through any particular fault in the engine. It speaks pretty well for it. Would it be possible to make a large engine say 200/220 HP. You might think it over and let Commander Briggs know. J W Smith sold his share of the business (UK patent rights) to Mr Heenan of Heenan & Froude Ltd in early 1916 but stayed on under contract in UK to help the business at the Admiraltys request. The Smith motor production was moved to Heenan & Froude Ltd at Worcester (see www.miac.org.uk/heenan.htm ) in April 1916 and the manufacturing suffered a number quality problems leading eventually to the engines rejection by the Air Board. The company had an initial order for 250 engines. There had been plans to fit a 140 HP Smith Static Motor in a prototype seaplane PV4 designed by the Admiraltys Port Victoria Marine Experimental Aircraft Depot in 1916. The engine was not delivered so a Clerget was tried in June 1917 but this proved too long in body (compared to the Smith) to rig the machine for longitudinal control across the speed range. A prototype for another Admiralty designed float plane the AD Naviplane No. 9095 was built in 1916 by Supermarine initially with a 150 HP Smith Static, but this proved underpowered and the engine was replaced by a Bentley Rotary 1 in 1917 which also failed to deliver the required performance. The design was abandoned. The Blackburn TB twin engine seaplane had been another possible user of the Smith 140 HP engine but smaller engines had to be fitted and again it proved under powered. A new company, Smiths Static Motor Company, was registered in November 1916, essentially holding the UK patent rights for the Smith motor. Heenan with Schofield and others were Directors of the new company. J W Smith had then returned to the US because of his wifes ill health (she was a survivor of the sinking of the RMS Lusitania and continued to be in poor health). Watson continued to work for Smiths Motors and went to France as part of efforts to promote the engine to the French Air Service. By October 1917 a 190 HP engine was available and being offered as a test engine to the French. Watson had been asked by J W Smith to file patents for the engines in France with a view to licensed production. Watson reported that negotiations with the French were hampered by the lack of clarity as to who was running the company in UK. Schofield had visited Paris in November and fallen seriously ill and proposals were not progressed. This seems to mark the end of the line for the Smiths engine. The British Ministry of Munitions had taken a decision in 1917 to concentrate engine manufacturing efforts on six aero engines two of which, the Clerget and Bentley Rotary 1 (BR1), were in the same category as the Smith Static. It would seem that the Smith companys efforts were consequently directed toward the French market. After WW1 the French company Darracq which had built FB5s under licence from Vickers acquired Heenan & Froude Ltd. The latter continued in existence after the Darracq amalgamation with Sunbeam Talbot, as STD, and was sold off as a going concern after STDs bankruptcy in 1935.